There are three ways to easily add contacts to FollowUp Personal CRM. We do this one for you 😉 Once you download our extension, FollowUp automatically imports your Google Contacts. This process won't take longer than a couple of minutes and brings all of your Google Contact's information such as notes, phone numbers, and email addresses directly to FollowUp. Our contextual sidebar displays contacts as you interact with them in the email. If you haven't added someone as a contact yet, they will have a plus icon to the right of their name, as seen below. Note* - clicking the blue eye will ignore the contact's profile so it does not display, and is good for marketing emails and other "fake" contacts. 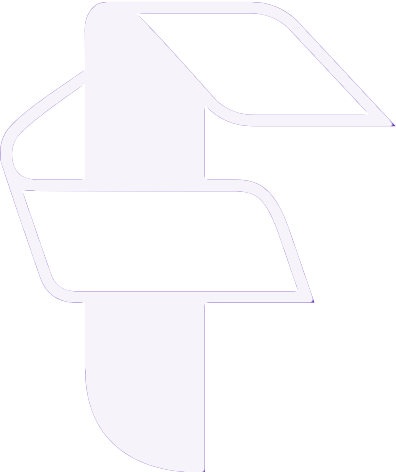 Clicking this plus icon will populate their name and email into our Add a Contact form. From here you can add the contact without further action by selecting the "Save Contact" button, or choose to input more information before saving them as a contact. To manually add a contact, select the Home View from the bottom left-hand corner of the sidebar. Next, click the new contact button in the center. You'll see a list of fields to input your contact's information. None of these fields are required in order to create a contact, so you can add as many or few as you like. When it comes to emails, you may add additional emails to a contact and distinguish the difference in types of emails by selecting the "Email" text above the field (pictured below). 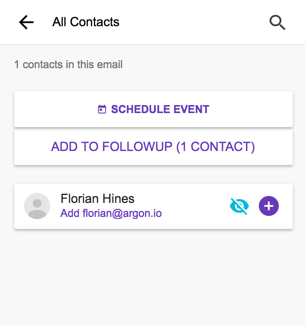 Once the contact field is added you can add notes, create reminders, or schedule events with them directly from your inbox.